I appreciated showers in high school. I would come home after a hard football practice and just park my body under the hot water for a good long time. It soothed my sore body and cleaned me up a bit. I’m sure that’s where my love affair with hot showers began, but it wasn’t until college that I identified the role that showers played in my emotional, mental, and spiritual health. 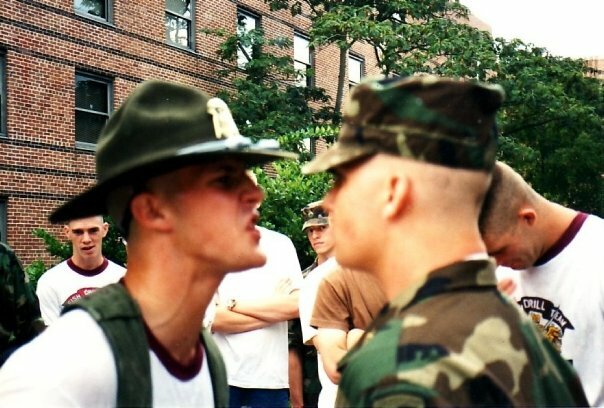 When I started college at Texas A&M in the fall of 1994, I jumped into the hard life of the Corps of Cadets and Army/Navy ROTC. The days were long and the stresses were high. Life as a freshman was complicated at best, and a nightmare at worst. Even shower times were risky. Shower time was supposed to be a safe time and space for freshmen, but we were hurried through the process and there was always the discomfort of knowing there was an upperclassman in the next stall. That said, we were able to find some safe moments to take a relaxed shower. We would wait patiently for the upperclassman to leave on weekend nights, and then a few of us would enjoy the shower stalls all to ourselves. We weren’t allowed to have conversations in the bathroom as freshmen, so it was nice when we could find ourselves alone there. Sometimes we would risk a conversation or even a song or two. There are two specific times in the shower as a freshman that I remember quite clearly. I was a part of a rifle drill team my freshman year that prided itself in its psychological and physical challenges. We came in second place during a meet in the fall of that year, and consequently we were to be punished. Our punishment included what seemed like a never-ending run complete with countless stops for push-ups, sit-ups, and whatever other painful exercise the advisors could think of. It was the most rigorous physically and mentally challenging experience that I had participated in up to that point in my life. There were two other young men on this team that were from my particular ROTC unit, and when the night was over we were ruined. We stumbled up the stairs to the 4th floor of our dorm, exhausted. One of the few immediate benefits of being on the team was that when we were in our drill team uniforms we were not messed with by our upperclassmen. Black helmets on, and rifles in hand we made our way to our rooms, locked up our weapons, and then headed where we knew we could find comfort. We didn’t even bother to take our uniforms off. I can’t remember if we cried or not, but I remember being broken. We turned on the hot water in our separate stalls and lay on the floor of the shower for what seemed like an hour. It might have been. The upperclassmen knew what we had been through and they respected that time. The hot water soaked into our clothes and into our souls. Adversity can certainly bring men together, but it is the moments after the moment that can really solidify a strong bond. It was the time in the shower; broken and vulnerable that endeared me to my brothers in arms. I can only imagine the showers that were had after some of my friends fought in real battles in Iraq and Afghanistan. I do not share in that brotherhood. They share a look between them that only the shadow of death can produce. After my freshman year Christmas vacation I went back to Texas A&M a week early to participate in what the drill team referred to as “Hell Week.” It was. If that night of punishment in the prior fall had been the hardest evening of my life, this was the hardest week of my life. It was brutal. The physical pain and psychological trauma kept coming. The days were long. Every minute was long. At one point in the week I was told to stay in the leaning rest (push-up position) for an hour. Sleep was appreciated at the close of the day, but the anxiety of the next day’s pain made the nighttime clock tick like a time bomb. The only real time of emotional and psychological comfort was in the shower directly after practice. The upper classmen that were on campus a week early were strictly instructed to leave us alone and the showers were even more havens than during the semester. We could commiserate during those showers as well. Needless to say, those showers ministered to my mind, soul, and body during that season and I owe God and man gratitude for systems that produced endless streams of warm water. The second specific shower event I can remember well is tied to a third event that would happen a year after the second. After making it through a year of walking on coals, those of us who lasted were given a distinguishing cord to wear on our uniforms. The cord had been the light at the end of the tunnel; an acceptance letter to an exclusive fraternity. It symbolized a vault of emotional, physical, and mental effort that had gone into making it through that year. We attended the banquet held in our honor, received our cords, and then went back to campus for another initiation. Alcohol was a big part of many organizations at Texas A&M, but FDT prided itself in taking all things to the extreme. So we met at the selected destination and bottles were produced. I will never smell Southern Comfort the same way. Even today it induces a gag reflex. It was an honor to sit with our upperclassman and drink in achievement. While other freshmen were still cowering in the hallways, we were sitting with those we had feared and joining them as overcomers. But I did not overcome the liquor in my belly. I drank shot after shot, chasing each shot with a bit of beer. All in all I took down 15 or 16 shots of Southern Comfort, or at least that is what I remember. We had no meat on our bodies. We were all muscle and bone and the alcohol had no fat to dilute the alcohol. A couple of hours into the experience I couldn’t handle it anymore. I ran for the bathroom and began the purge myself of the poison. First I filled the sink and then the toilet with everything my body could send back up. Then I dry heaved for what seemed like forever. Every heave was a stab to the chest. I had never experienced that sort of internal pain. I looked like a ghost and felt like the damned. But the shower awaited. Once again I collapsed on the floor of the shower stall while the warm water washed over my sins. I probably cried tears of shame and pain as the water fell. I knew that I had gone beyond what was good. My experience that evening was representative of my entire time at Texas A&M; drinking deeply from the fountain of desire and knowing that there would be a debt to pay. After laughing at me a while and taking pictures, my upperclassmen nursed me into bed. I was beyond helping myself at that point. I had weakened myself and was dependent upon their care, but the shower made me feel cleaner once my body purged itself of what I forced upon it. I was thankful for the vomiting the night before as I woke up to go to drill practice the next morning. My buddy did not fare so well. His body waited until he was asleep to release its contents. I was put in charge of pulling him out of bed and cleaning him up, before dragging him to practice. Thankfully he did not suffocate in his sleep. A full year came and went and I found myself in a similar situation. This time I was the upperclassman and I was in charge of extending the drink. I had been kicked out of my original outfit since my freshman year ended but I still felt a sense of obligation and loyalty to the young men that I had encouraged to join the drill team from my old outfit. After I held a drinking ceremony with the drill team members in my new outfit I headed over to my old dorm to check on one particular freshman that I had invested a lot of time and energy in. By the time I got to the room where they were pressing the alcohol upon him, the intoxication was already beyond a safe point. The freshman was quickly becoming unresponsive. I knew that we couldn’t put him to bed in this state. The close call with my buddy the year before made me extra sensitive about this sort of thing. We slapped him, shook him, and yelled at him, but he was far into the grasp of the poison. So I lifted him up in all of his dead weight, and carried him down to the showers. I knew the healing power of the showers. We had him strip down to his briefs and we alternated hot and cold as he lay scrunched up in the floor of the shower stall. I was concerned, but the water eventually did its job. He slowly became more responsive over a course of 20 minutes or so, and he eventually purged himself of the numbing agent that took him under. I helped him into bed and hoped that the damage was minimal. Since those days in the Corps of Cadets I have returned to the shower many times. It still remains a sacred place for me. I have gone there to confess my sins and beat my chest. I have gone there to consider the pain that I have inflicted on those dear to me. I have gone there to grieve over the death of my father and to pray for my marriage. I have there felt the fear of losing my daughters and the assurance of an intimate God. The warm water has always been there, waiting to speak conviction and comfort. It has driven me deep into my soul on countless occasions, to the place where God has set up residence. He speaks to me as the water reminds me of my sin and my forgiveness all at once. The Spirit is said to be like the wind, but he has been as the warm water to me just as much as he has touched my face with the breeze. I also remember, as a 5th grade boy, you loudly crying in the shower when Socs, our first boxer that we had had since you had been two, died. Was so hurtful to hear your tears. And we all had them. Amazing writing Jason…..powerful.